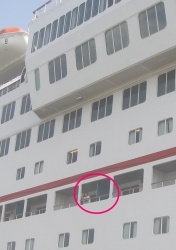 On our first cruise, one of our tablemates never left the ship—purposely. Granted, it was a four-night cruise stopping in Nassau and at a private island, both of which she had visited many times before. 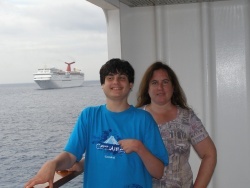 Yet, I found it interesting that “Joey’s Mom” would book a cruise and, in my opinion, not go anywhere. Fast forward 20 years and 30 cruises later—and it was now my turn to stay onboard ship for an entire cruise. And, it made perfect sense to me, for a number of reasons. Staying onboard for the duration of the cruise was not my intent when we booked it a year earlier. The planning process for this cruise—a 7-night Western Caribbean cruise on Carnival Elation—was much like that of other cruises. We had decided to cruise with friends, and selected a ship and date that worked for both of our families. It wasn’t until roughly a month prior to the cruise that I started giving this idea some thought. I don’t recall exactly why. Perhaps it was a memory of the dear lady on our first cruise, who always seemed so relaxed at dinner. Maybe it was to give myself more time to explore a class of ship I had not been on previously. (I am a budding ship historian, after all.) Quite possibly, the beaches in the ports didn’t appeal to me as much as having a somewhat private swimming area on the ship with neither sand nor undertow. Leaving behind a stressful job situation was also a factor—I yearned for some quiet time that did not require watching a clock or calendar. Or, as our last few cruises were very port intensive and far from home (Alaska, Mediterranean, British Isles, Norway), I thought it would be nice to simply enjoy a ship. In the end, it boiled down to all of these, in no particular order, with a little bit of “why not?” thrown in, as well. Immediately upon making this decision, I discovered one key benefit—the simplification of planning for the seven days of our vacation. Of all our cruises, this is the one I had to research the least, enabling me to focus on other necessary tasks in the month preceding the cruise. Typically, I prepare a travel binder that contains numerous sections, the most detailed of which outlines the history of and attractions within our ports of call. For this cruise, the binder was rather slim, containing only the current deck plans, weather report, travel confirmations, and information on Mobile (where we would spend one night pre-cruise and one night post-cruise). My plan was also consistent with my goals for this cruise—to read, sun, get pampered, get to know the ship, and forget there was an outside world. The last few pages of my journal indicate that all of these goals were met, albeit some more successfully than others. Setting an alarm clock was not on the agenda, something I rather liked. I did note some aspects that detracted from my enjoyment of my self-imposed ship days, although these were minor in retrospect. I had been hoping for port day spa specials but, alas, the spa was closed on all three days on our particular cruise. I had also looked forward to having a long, quiet lunch in the main dining room—a favorite experience when I cruise—yet it was closed, as well. I understand the reasons, yet, interestingly, the main dining room had been open on port days on our Norwegian Jade cruise in the Mediterranean cruise earlier this year, where the ports were the main attraction and many passengers took tours, accordingly. Naturally, I had expected far fewer services on the ship when we were in port, yet I did miss these two. No worries, as I found plenty to occupy my time. After two sea days, our first port of call was Montego Bay, Jamaica. According to my journal, I had a leisurely breakfast in the main dining room at 8:00, and was in the gym by 9:00. The gym was wonderful—there was just one other passenger, so I had my choice of treadmills, free weights, and other equipment. And, with no motion from the ship, I felt very steady on the fit balls and comfortable enough to hoist heavier weights sans fear of toppling over and possibly hurting myself and others. I followed this with a mile walk on the jogging deck—again, fairly empty, allowing me to go at my own pace and not worry about bumping into other passengers (or vice versa). After returning to the cabin for a shower, I changed into my swimsuit and sat by the amidships pool for a while, where I did some reading and sunning. I also enjoyed some pool time with the family, who did not stay ashore for very long. I had a wonderful lunch at the Mongolian Wok—no lines! By 1:30, passengers were starting to return, so I retreated to the cabin and was soon sound asleep! So much exertion! The next day was spent pretty much the same way—breakfast, sunning, pool time, lunch, and nap. We were anchored off of Grand Cayman from 7:00 am until 3:00 pm, so the day felt shorter than the prior one. I also studied some of the ships that were in port with us—Grandeur of the Seas, Carnival Imagination, and Carnival Freedom. I also started decluttering the many papers in our cabin that had been accumulating in our cabin the past five days. And, I made a lot of progress in my book. The following day found us in Cozumel. This was the hardest port for me to skip, as I have enjoyed Cozumel in the past—yet I was too close to give up now. I decided to spend part of this day exploring the ship and taking photographs of many of the public rooms. I also discovered a window seat on Deck 12 near the atrium elevators, into which I settled for much of today’s journal writing. There was also more ship studying today, particularly the new Water Works area on sister ship Carnival Imagination and my first look at the behemoth Royal Caribbean ship Oasis of the Seas. I revisited the gym and jogging track. I had my second lunch in the main buffet area, Tiffany’s, made easier by the lack of crowds that usually deter me from similar venues on any ship. I also shared wonderful conversation with several other passengers who had stayed onboard, and later got in some pool time before the majority of passengers returned. The opportunity to spend an entire week on a ship without experiencing the ports of call doesn’t come often, so any regrets were short-lived. On our next sea day, when shipboard life was back to normal, I realized the advantages of having a nearly empty ship for the prior three mornings. Although there were a few disappointments regarding the lack of certain shipboard activities, it truly didn’t matter in the end. There were many highlights for me, including journal-writing, book-reading, gym-going, and sunning—activities that I don’t get to do at home as often as I’d like, or at all. And, most importantly, there was an abundance of peace. Yes—I’d do it again, although perhaps on a shorter cruise. And, to “Joey’s Mom” from our first cruise—thank you for the inspiration.